Like most creatives, night time is often when my ideas are the most fluid. My mind floods with writing topics, products to create, and new memories I want to make. This creative flow along with a peak in my energy, evenings are Most nights my creative flow interferes with my ability to sleep. Unfortunately, being a night owl doesn’t work for my lifestyle. Between getting up early for work and getting my fellas off to school, staying up to 1 a.m. just doesn’t work for this over 40 momma. It’s not that I don’t like morning-I do. I am just more creative at night. Somewhere along the way, I had to find a balance between being a night owl and the demands of my lifestyle. Instead of trying to make myself into someone I am not, I decided to create night-time habits that would allow early mornings and my inner night owl to coexist. Instead of focusing on what I needed to do in the morning, I focused on what changes I could make at night. This one change made all the difference. 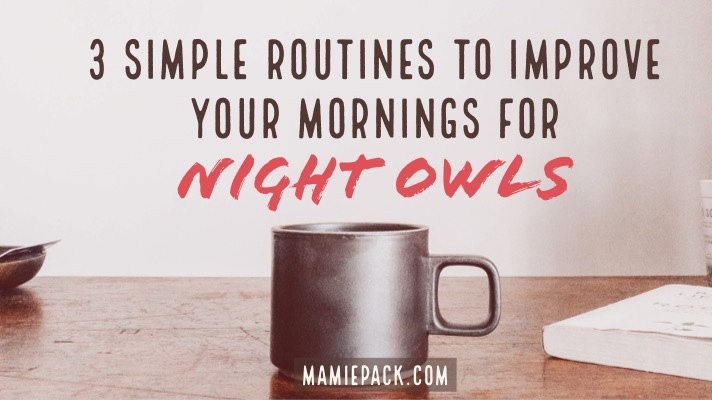 If you struggle with how to rock your mornings when you are a night owl, then I have a few ideas you can do at night to help you out. Preparing the night before is by far the easiest and most helpful step for me. As a educator and momma, one of the quickest ways for me to become irritated in the mornings is rushing. I end up rushing because I can’t find what I need and my fellas are not ready. One way to combat this problem is night-time prep. Preparation starts with YOU. Before going to bed, think about everything you will need in the morning. Looking at your calendar list everything you will need to have a successful day whether that means packing your gym clothes, preparing your lunch, or making sure your phone is fully charged. Once you have everything prepared, put it IN your vehicle or by the door. You want to make sure you have what you need in a place you are sure to see it. As a momma, I also have my fellas pack their bookbags, prep their lunch, and set out their shoes and clothes. There is nothing worse than waiting for your kids to look for their shoes, homework or sports equipment when it’s time to walk out the door. Each of our boys places their packed items near their bedroom door as a part of their nighttime routine. This helps our mornings to go smoothly and teach them the importance of being prepared. Most nights I set time aside to be creative. Since I know my mind is most active and creative in the evening, I don’t fight this process. Usually, I block off time after my fellas have gone to bed so that I can read, create, or write. Just getting my ideas out of my head and onto paper gives me the release I need to relax. To be creative at night, it’s important to set boundaries. Most nights you cannot spend hours writing, designing new products, or editing your work, especially if you have been up all day working and/or taking care of your kids. So, you have to be flexible with your time then safeguard it. Keep journals by your bed, journals in your purse, and your laptop close. If you are married, set time aside that will not interfere with connecting with your spouse. Why is creating a productive morning important to you? Of course, you could say that your life requires it, but I can tell you that it is not enough. Just because you have to get up in the morning will not be enough motivation to get you out of that comfy, warm bed without hitting your snooze button five times. We each need our why. What do you want to do with your time? For me, getting up early in the morning is about spending time with God before I interact with the world and spending time with my fellas. After another morning of fussing and rushing my fellas out the door, I was convicted. I was not giving my children the best of me. I didn’t want to get up barely able to interact with the world, upset that I was given the opportunity to wake up another day. Every morning, I have to remember my why. At night, determine why you are getting up. Write it down and keep it close to your heart. Your why will be the motivation needed to get your night owl body moving in the morning. So momma, if you are a night owl like me, you can still rock your mornings without being an early bird. Instead of tackling your morning routine, try making the most of your nighttime routine. What nighttime habits helps you be more productive in the morning? I’m a night owl too, it can be hard. Definitely worth getting up even 30 minutes earlier! I used to be a huge night owl but now am in bed before 9am! I love my sleep so these tips are still super helpful as I wait until as long as possible to get out of bed! That is great you were able to change your habits. Sleep is definitely my friend! I am an early bird with night owl children so we have all had to make some adjustments. Such great tips here. For me the preparation after a long day is hard but so worth it! Oh, now that is interesting. These tips are good for kids too. I wish I knew about brain dumping and allowing myself to be creative when I was younger instead of fighting it. I am a night owl, wishing I could be an early bird and have not yet figured out a transition strategy that works. In the mean time, I will use your suggestions to obtain more balance. I particularly like the planning the night before. I am single and don’t always PREpare for the next day. But I can see how developing this habit will benefit e, especially when I don’t fall asleep until a few short hours before I need to be up. Thanks for sharing. God bless you! Doing the preparation the night before will help for sure. Even little things like making your lunch will add up. Me either Mary! With three boys still at home, preparation is my friend! Great tips. I use to be a night owl and occasionally find myself back there. Brain dumping I have found has been the biggest help for me. It allows me to sleep better and be better prepared the next day. That’s awesome! Do you write before everyone is up? I’m definitely a night owl but I do find myself having good ideas for my writing sometimes innthe morning and in the evening. You have provided some really good tips! I’ll be trying them out soon. Those creative bursts can hit you anytime. It definitely helps little steps at a time. I have ALWAYS been a night owl as well. There is something about the silence at night that just makes it easier for me to think! I love these ideas and need to be better about preparing for the next day on the night before. Thank you for the reminder to work on that! And also, don’t forget coffee, haha! Coffee is the saving grace of my day! Setting time aside the night before is so important. It’s a live saver for my kiddos. It cuts our morning to-do list in half! Right! Such a simple task but a game changer. Such great tips! I am for sure a night owl, but that doesn’t work well for me with a 19 month old who still nurses and wakes up in the middle of the night. I can’t wait to try these tips out and see how they help. Oh, yes momma! I remember those days. This post spoke to me. I am currently savoring my me time to be creative, but know that I need to head to bed soon. I am patting my back because I already laid out the church outfits for tomorrow morning and prepped the fridge. However, this doesn’t happen every night. Thanks for the encouragement to make this a priority. My night owl self and haggard morning survivor alter ego thanks you. These are great tips! I always found that prepping the night before made the biggest difference in the mornings! Especially to not feel rushed or overwhelmed. Right! It makes such a difference. I’d never really thought to concentrate on the ‘why’ in a positive way – on the contrary, I’ve been pretty harsh on myself dwelling on the consequences of not being bright & ready. It’s solid advice and I’m going to try to work on my morning-deficiency with that in mind! Megan I used to be hard on myself too. Now, I embrace it and make adjustments others places. Great post! This is SO me! I do the prep and definitely burn the midnight oil, but I will always HATE mornings! It definitely helps even when mornings are a challenge.